Nokia E71 is a wonderful smart phone which comes with WLAN Wi-Fi Technology. This 3G enabled device provides fastest connectivity with various advanced features. Texting messages through this handset have become quite easy with QWERTY keyboard and smooth navigation. It is available in two colors, white and grey. The handset is slightly heavy because of the solid and durable design and it weighs nearly 127grams. The TFT display screen is 2.36 inches wide which provides the users 16M colors. So you can easily guess the clarity and image quality will never be very disappointing. The device can store unlimited number of contacts and phone numbers in the phone book. The internal memory offers 110 MB storage spaces with 128 MB RAM. This will give you a big opportunity to download a vast number of your favorite soundtracks from internet. This mobile allows browsing internet and chat with friends. You can also send them text messages via SMS or email. You will be glad to know that you can experience live chat with your friends through video calling facility. With Nokia E71 you will never feel disconnected with your contacts. When you are sitting idle, you can enjoy the device just like a portable radio and listen to unlimited number of songs. Some people love to play games on mobile; you can also download Java games in the mobile and enjoy a lot playing them. If you feel insecure whilst walking down the unknown road then take advantage of the in-built A GPS navigation system and go through proper direction. The mobile gives the user full access to internet with high speed connectivity just like the home or office PC while he is traveling. This smart phone is an obvious preference for every smart buyer. You can take pictures of a beautiful place or any important moment in your life. The 3.15 MP camera with 2048×1536 pixels resolution will provide you incredibly high quality photographs with a single click. If the picture has been taken in low light atmosphere then the LED flash will make it brighter without making it dull. The mobile set also functions as a video recording device. 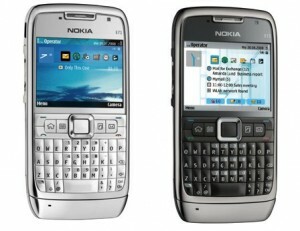 The powerful standard battery of 3G Nokia E71 handset allows constant 4 hours 30 minutes talk time. So if you are not carrying your charger, you can still stay in touch with your friends for the whole day without being disconnected.